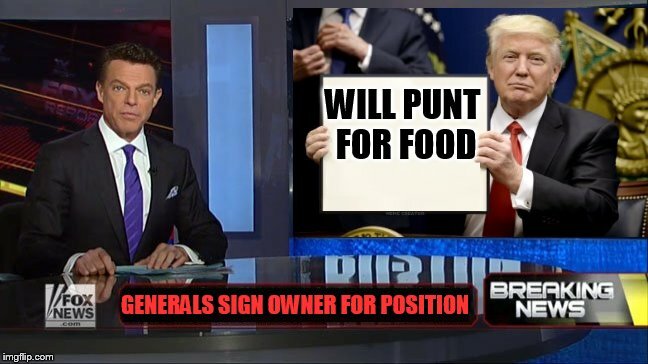 New Jersey Generals owner Donald Trump was up to his usual grandstanding Friday as he ordered GM/Coach Chuck Fairbanks to draft him as the team's punter/kick holder. Time will tell if this is legitimate or a joke but wouldn't you like to be a fly on the wall if Fairbanks has to cut him? The controversial Trump is starting to gain a reputation as a loose cannon and rumor has it he wants to go head to head vs the NFL someday. It sounds like a pipe dream but he believes he can win an antitrust lawsuit against the NFL and force a merger. LMAO, with that kind of thinking he might as well try to be an astronaut or the President of the United States. Geez what a looney tune. In all seriousness I wasn't going to use this name just yet, my plan was to make him the QB 3. When looking over the 3 years worth of the real Generals rosters I found 3 different punters so I decided now was the time. Please don't make this about politics as I didn't vote for him or Clinton, just couldn't do it. That's as far as I am going to go with politics, I only used this name for fun because he was the real NJG owner and this is something he would do. I was 14 when the USFL started and all I remember was he was a blowhard and enjoyed the spotlight. He certainly hasn't changed much the last 35 years. Re: Generals draft their owner?